Across from the fishing village of Kilada lies the pre-historic Cave of Franchthi. Internationally, it is known for its valuable findings, which date back to the Mesolithic period, over 40,000 years ago. Prof. T.W. Jacobsen from the Archaeological School of Indiana University carried out extensive excavations from 1967 until 1976 and brought to light an entire phase of Greece's prehistoric culture, buried in layers of soil, 4 metres thick. From this research they found the oldest complete human skeleton in Europe, dating back to 23,000 BC, as well as other evidence, revealing the way prehistoric man lived. The cave would have been home for up to 30 people, originally hunters, as the sea levels have since risen about 20 metres. The cave seems to have been abandoned around 3,000 BC. In 2014, International archaeologists finally confirmed that Franchthi is the oldest human dwelling or settlement in the whole world. There are many findings from the Franchthi Cave and most are displayed at the Archaeological Museum of the Peloponnese, in Nafplio. This is a very important historical cave and well worth a visit. If you are brave enough to climb through to the top of the cave, the panoramic view from there is spectacular. The marked pathway from the Franchthi beach along a narrow winding coastal footpath, will give you beautiful views of the picturesque fishing village of Kilada and the privately owned Koronida island. The cave is still in its present natural state, but there are plans to make the cave into a tourist attraction. What this will mean is not clear, one advantage could be direct access by boat from Kilada. Quite recently the cave interior has had a wooden walkway laid, information boards erected and safety handrails fitted around the deep pits created by the archaeological excavations. 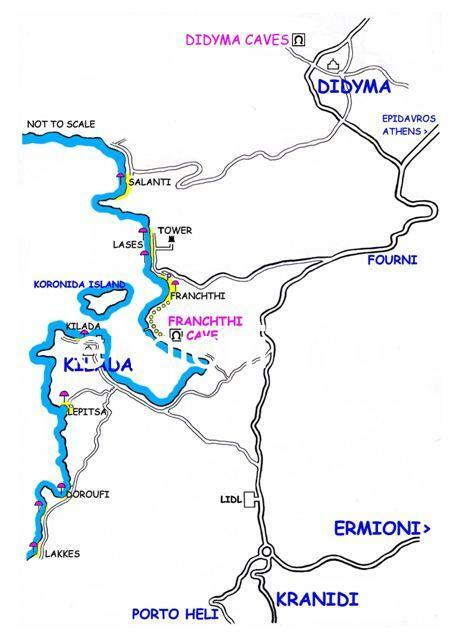 If you are driving from Ermioni, the best way to reach the Cave of Franchthi is to head towards the village of Fourni on the main Ermioni to Epidavros road. Just before the village of Fourni, on your left you will see two big road signs pointing the way to Franchthi. At the end of this road turn left and you will eventually arrive at the Franchthi beach, where you will have to leave your vehicle, and make your way to the far end of the beach. There, near some rocks, you will find the start of a narrow winding coastal pathway, marked with red arrows, marking your way to the Mesolithic cave. The walk along this scenic coastal pathway will take approximately 20 minutes. If you turn right at the end of the Franchthi road, follow the road sign and you will arrive at another small shingle beach, around the headland from the beach and Cave of Franchthi. Turning inland from this beach, you will arrive at a small hill on your left, surrounded by a wire fence, where you can leave your car. Take the short uphill walk and you will see the foundation stone remains of the Macedonian built Watchtower. This is a good vantage point, of the bay of Kilada and the central Peloponnese.